Khurvaleti, Georgia, January 1, 2017: It’s a cold but clear winter day. Conditions are ideal for a photo opportunity. 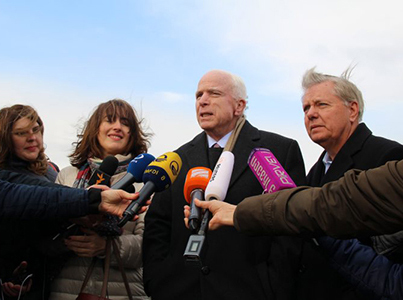 US Senators John McCain (R-Arizona), Lindsey Graham (R-South Carolina), and Amy Klobuchar (D-Minnesota) are paying a visit to the “Administrative Boundary Line” that separates South Ossetia from the rest of Georgia. McCain captures the day’s most memorable moment when he shakes hands with Dato Vanishvili, a native of Khurvaleti who, in 2009, went to bed in Georgia and woke up in South Ossetia–during the night, Russian soldiers had moved the demarcation line past his house and deeper into Georgian territory. That day trip to Khurvaleti was part of a two-day visit to Georgia, the purpose being to reassure Georgia’s government and public that the United States remained a loyal, firm friend and partner, notwithstanding the sympathy toward Russia and its president, Vladimir Putin, that had been expressed by President-Elect Donald Trump during and after the campaign. In the roughly seven weeks since the senators’ visit, President-Elect Donald Trump became President Donald Trump, and the views of President Trump depart considerably from those of the foreign policy establishment. That goes especially for McCain and Graham, both members of the Senate Armed Services Committee. Since assuming office, Trump has repeatedly shunned their foreign policy initiatives, even accusing the two senators of “looking to start World War III” after they criticized his executive order halting immigration from seven Muslim-majority countries. Despite the derision coming from Trump, McCain and Graham are determined not to let up on Russia. After the visit, the two senators cosponsored the Countering Russian Hostilities Act of 2017, a bipartisan bill that would strengthen existing sanctions and impose new measures against Russia. In particular, the sanctions go after Russia for its ongoing violation of the territorial integrity and sovereignty of Ukraine and Georgia, and its targeting of civilians in Syria. The proposed sanctions are also in response to Russia’s meddling in the US elections. If the bill passes, it will start by codifying Obama-era sanctions against Russia. The new sanctions would include freezing assets and denying visas to individuals accused of violating the cybersecurity of democratic institutions. The bill would also limit the ability of US firms to invest in Russia’s oil and gas sector as well as energy pipeline development projects, in addition to apportioning $100 million to counter Russian propaganda. Those measures would be big. As has been documented, the existing sanctions against Russia have not had the effect that proponents hoped. Russia’s economy has contracted for two consecutive years, but it has avoided economic crisis and the sanctions haven’t significantly disrupted its oil and gas industry. In addition to tougher sanctions, senators from both parties also proposed the Russia Sanctions Review Act, a bill that would prevent president Trump from withdrawing sanctions on Russia without first notifying Congress. Legislators would then have 120 days to block the sanctions relief. “Congress must have oversight of any decision that would impact our ability to hold Russia accountable for its flagrant violation of international law and attack our institutions,” said Senator McCain. Events in the White House have created an opening for Congress to take on a bigger role in foreign policy. Trump advisor Michael Flynn became the shortest-serving national security advisor in history when he resigned on February 13 after only 24 days in the role. Flynn’s resignation came after The Washington Post reported he may have discussed sanctions in a telephone conversation with Russian Ambassador to the US Sergei Kislyak in December, prior to Trump’s inauguration. Flynn first denied the allegations, then backtracked, saying “he couldn’t be certain that the topic never came up.” After it became apparent that he had lied to Vice President Mike Pence about the phone conversation, his days were numbered. If sanctions were indeed discussed, the conversation was in violation of America’s Logan Act, which says that only acting members of the executive branch can conduct diplomacy with representatives of a foreign state. According to reports, no deal was made between Flynn and Kislyak. However, the call did breach protocol and fueled growing speculation that members of Trump’s team colluded with Russian officials both before and after the presidential election. For some, the scandal sent a message that the Trump administration was simply incompetent. “Gen. Flynn’s resignation is a troubling indication of the dysfunction of the current national security apparatus,” read a statement from McCain. Adding insult to injury, the favored candidate to replace Trump, retired Vice Admiral Robert Harward, turned down the position. It ultimately went to Lieutenant General H.R. McMaster, a highly-regarded active military officer who earned a PH.D. in American history before earning a decorated record of service in both US invasions of Iraq. With the White House reeling from the fallout of Flynn’s resignation, Congress may be able to seize the initiative and place additional checks and balances on President Trump’s foreign policy, especially regarding Russia and NATO. Currently, several members of Trump’s campaign team are being investigated by the FBI for potential ties to Russian intelligence agencies, as anonymous intelligence sources told the New York Times. These investigations could result in public hearings in House and Senate committees. Although the chairman of the House Intelligence Committee, Devin Nunes (R-California) said he will not be investigating Flynn’s phone call with the Russian ambassador, Democrats in the legislature are more concerned about alleged ties between the White House and Russia. Senator Klobuchar called for a bipartisan, independent commission to investigate connections between members of Trump’s team and Russia. Georgian officials have taken the initiative in establishing direct communication with president Trump’s cabinet. Earlier in February, Georgian Foreign Minister Mikheil Janelidze, was one of the first diplomats to meet newly-appointed Secretary of State Rex Tillerson. 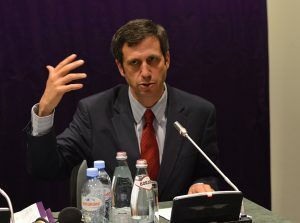 Georgia’s government has worked hard to normalize relations with Russia, especially in the economic sphere. 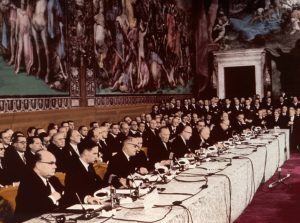 Diplomatic relations remain frozen as a result of the August War in 2008, but the parties meet within the Geneva International Discussions format, usually discussing issues related to trade. Georgia is taking a pragmatic approach; improving relations with Russia while staying firm on the path toward eventual EU and NATO membership. Still, Russia’s military occupies roughly one-fifth of Georgia’s territory. The country is under constant threat and is dependent on the diplomatic and security support the United States provides. When Trump assumed office, it was suggested that his team would take a softer approach toward Russia, something that Georgia understandably viewed with unease. Officials in Tbilisi may be able to rest a bit easier. As can be seen from the scandal that cost Michael Flynn his job and put the spotlight on other cabinet officials, there are powerful domestic obstacles to such a rapprochement between the US and Russia. Trump may want rapprochement, but does anyone else? Talk of the Trump administration drastically altering America’s foreign policy orientation now appear premature. Russia hawks in Congress are as determined as ever to defend the status quo in Eastern Europe, including in Georgia. 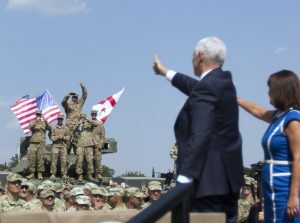 That means keeping NATO strong, unified, and open to new members, and putting up fierce resistance to Russian aggression, with economic sanctions as the weapon of choice. Additionally, the past two weeks have told us much about how Trump’s cabinet members view Russia, NATO, and Georgia. Tellingly, news of Flynn’s resignation didn’t go over well in Russia. His replacement, H.R. McMaster, likely won’t be viewed as favorably by the Kremlin. 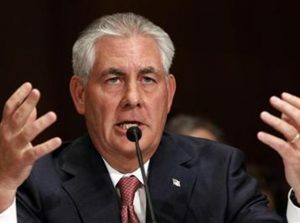 Moreover, Tillerson’s first meeting with the Georgian side showed the new administration won’t break with existing policy, at least not overtly. Under President Trump, America probably won’t stick its neck out for Georgia. However, a “grand bargain” involving the US extending sanctions relief and a freer hand in Eastern Europe in exchange for help fighting ISIS and other Islamist terror groups looks a lot less likely than it did just a few weeks ago.